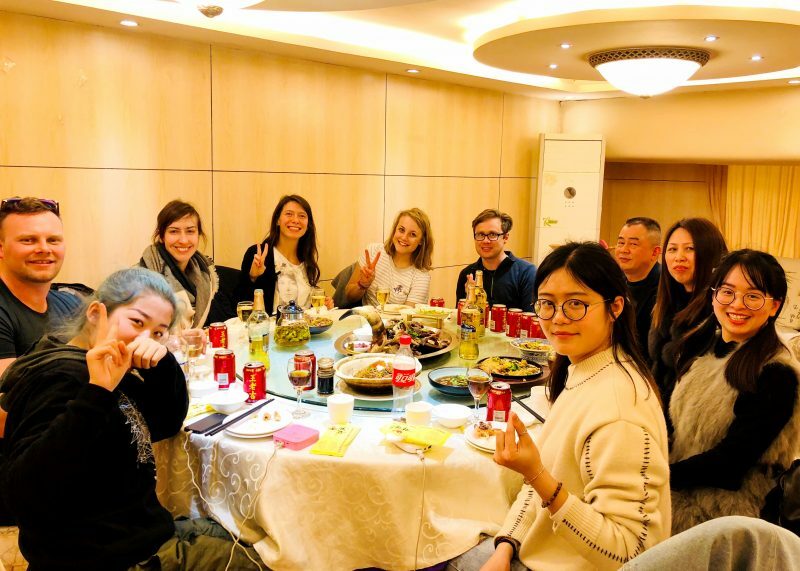 ​Saturday morning a couple of smaller groups headed to Nanjing to explore the capital of Jiangsu Province; the city has a population of 9 million people, which is about the same as London! Our group was lucky to have a Nanjing local, Elaine, as a guide for the day – helping us navigate the metro, the tourist attractions and the high speed rail. 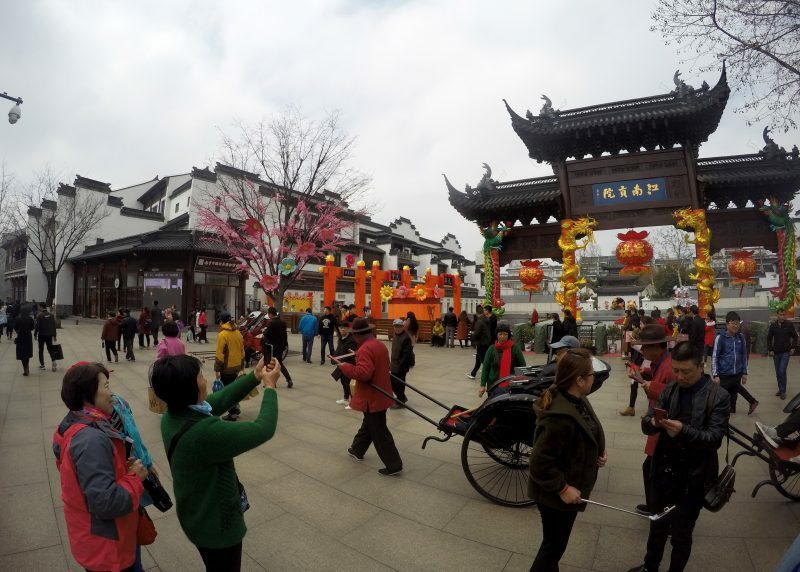 Nanjing is largely enclosed within a Ming Dynasty city wall, and lies on the Yangtze River (the third longest river in the world) with the Zhongshan Mountain overlooking the city. 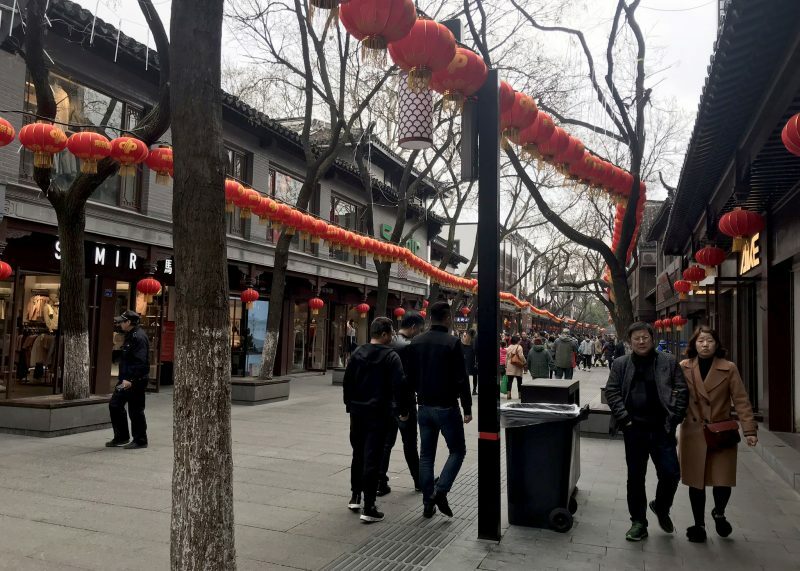 People have been living here for around 5000 years, the city is listed as one of the Four Great Ancient Capitals of China (along with Beijing, Xian and Luoyang) and has actually served as the country’s capital twice during it’s long history. First stop was the Nanjing Confucius Temple, which sits right by the Qin Huai River which was first constructed in 1034. There are a number of attractions to see in the area, but we just had a wander around – there is a lot of touristy shops, places to eat and there was lots of colourful decorations around too. It was really busy, 99% Chinese tourists, in fact in the areas we’re visiting during the weekends it’s rare to see other foreigners. I’m really enjoying seeing these cities as I would have never have known to come here otherwise. The Chinese love an early lunch so we headed to one of Elaine’s favourite places for dumplings and noodle soup. 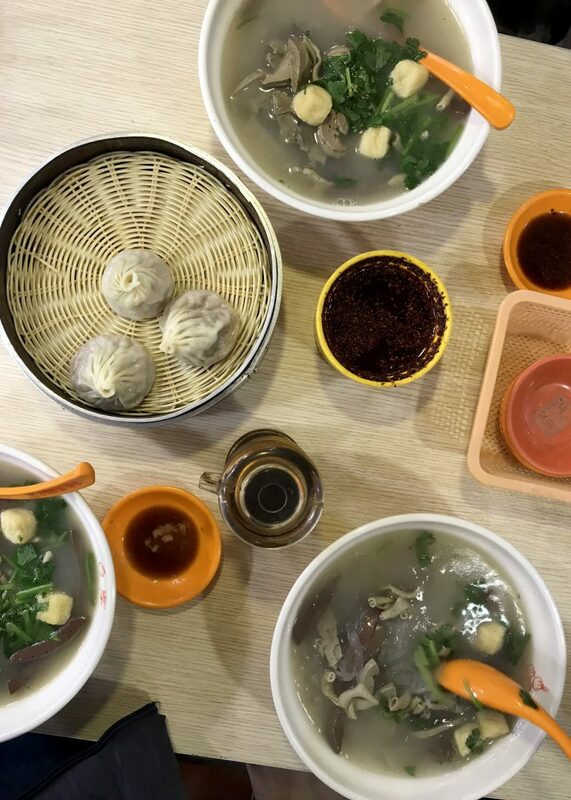 The dumplings, “chicken juice steamed bun” were delicious and the soup was a duck broth with a variety of bits of duck inside (how to use all of a duck, by China), “sausauge” (which is actually intestine), blood and liver with very thin clear noodles, cellophane or glass noodles. These are actually quite tricky to pick up with your chopsticks haha. 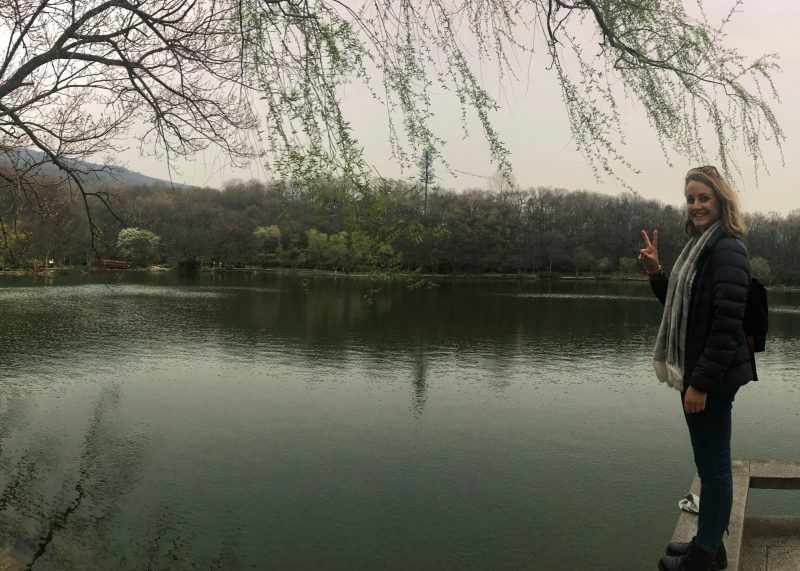 After a quick stop a shopping mall, we headed to Zhongshan Mountain National Park (Purple Mountain) to visit some of the historic attractions there. 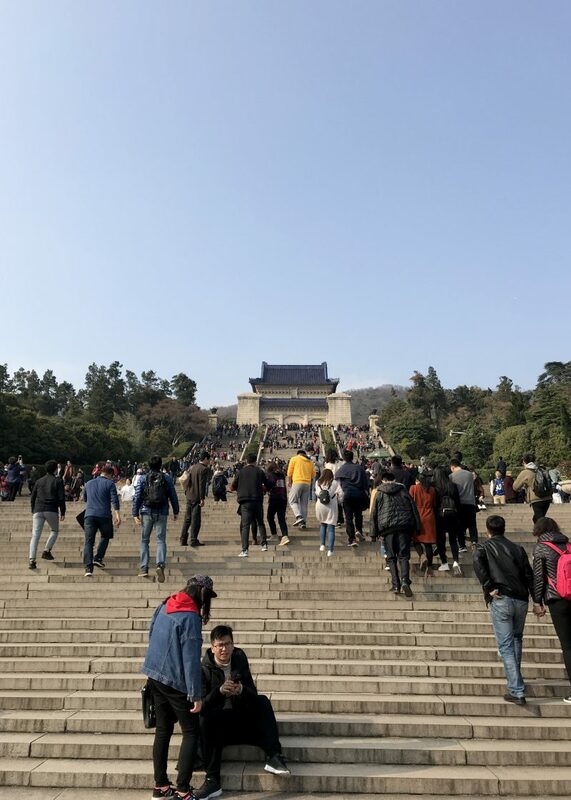 Firstly we climbed over 300 steps to see Dr. Sun Yat-sen’s Mausoleum. This is the burial site of Dr. Sun Yat-sen, the great pioneer of China’s democratic revolution and “Father of the Republic of China”. 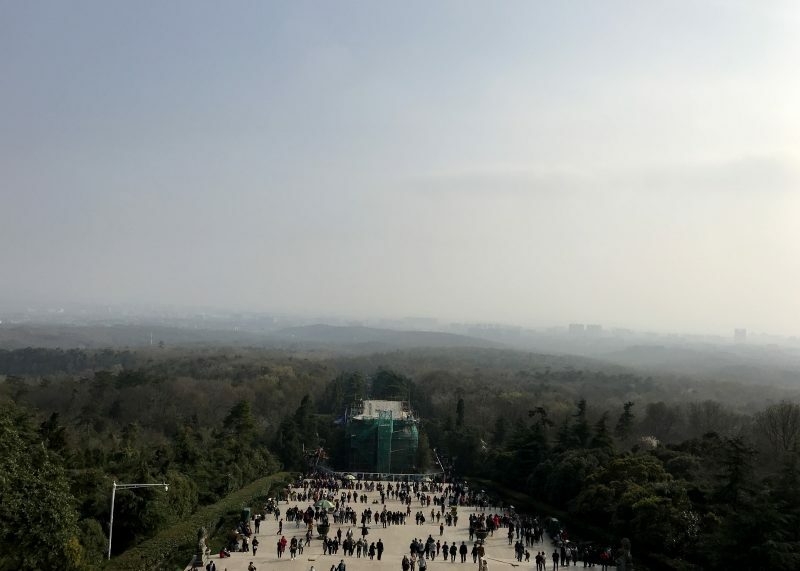 It was pretty foggy looking out over Nanjing once we got to the top, however I was told that in the summer on a clear day you can see for miles. 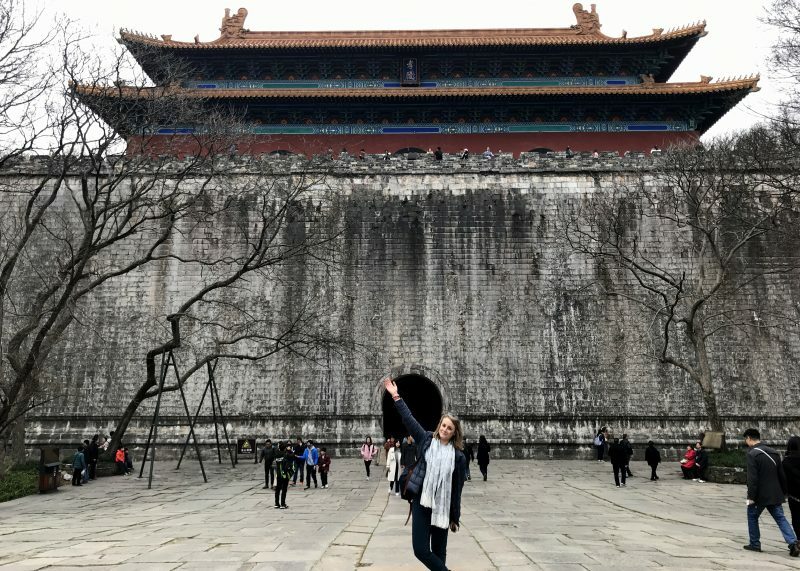 After a short bus ride, we visited The Xiaoling Mausoleum of Ming Dynasty – comprising of a number of huge buildings, constructed in 1381 and is the burial ground for Emperor Zhu Yuanzhang, the first Emperor of the Ming Dynasty (1368- 1911), and his empress who were buried in it in 1398. About 10 minutes away was the Purple Glow Lake, a very relaxing spot whereby a number of groups of locals were playing cards, some were swimming and meditating on the banks of the lake. 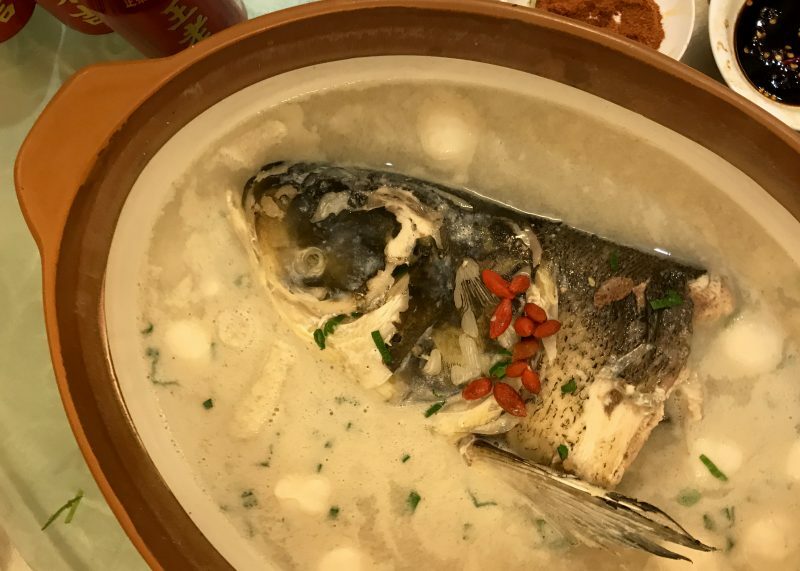 For dinner, we met with Elaine’s parents for an amazing meal at 胖鱼头, Pang Yu Tou which literally translates to “fat head fish” haha. Some amazing beef, noodles, peanuts, egg, rice, vegetables (I love the veg here) and of course the signature dish, a huge soup with a big fish head inside of it, served on the typical lazy susan. Another incredible meal trying all sorts of new dished – everytime we eat we find something new. 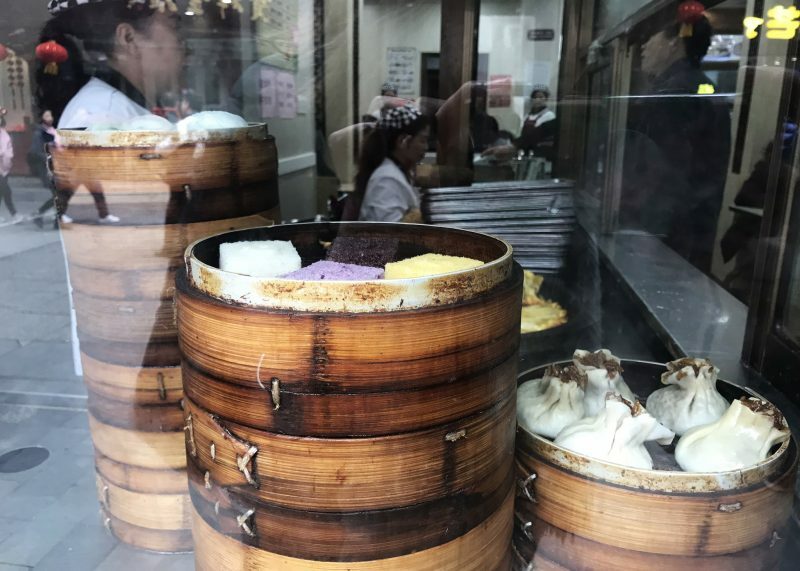 Each part of China is well known for certain dishes, and in this instance, even the restaurant itself is well known for it’s own dish. A delicious end the meal, with some fun translations between ourselves, Elaine, Willow, Chelsea and Elaine’s parents! Nanjing South Railway station was ENORMOUS, it was like a small airport; 2/3 levels, huge departure halls and vast ticket offices. 30 mins and 120km later on the high speed train and we were back in Changzhou for a well deserved sleep.